Rava dosa is the common tiffin dish seen in most of the South Indian restaurants. There are various varieties of rava dosas like onion rava dosa, masala rava dosa, ghee rava dosa etc.. but the batter for all these varieties are same. You can create your own rava dosas with your imagination. The basic ingredients needed for rava dosa are rava, maida or atta flour and rice flour. For flavours crushed or whole black peppercorns, cumins, curry leaves are added. If the flours are properly mixed with the correct ratio of water then it will be a lot easier to prepare restaurant style rava dosa for your family. You don’t need to buy any readymade mix for rava dosa. 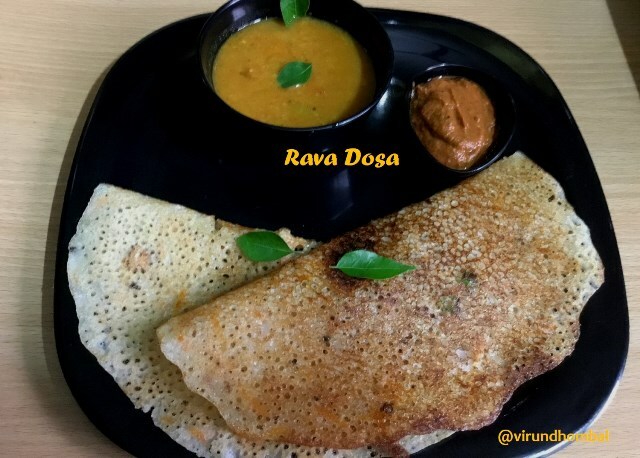 I have experimented this rava dosa with many practices and here I will share all of the techniques to prepare perfect rava dosas. For rava dosa batter we must be careful in two crucial parts. 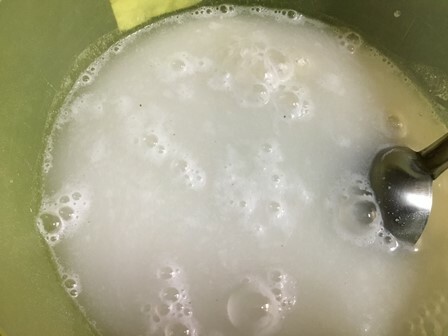 First one is mixing the dry ingredients with the correct measurements and the second part is mixing the batter with water or buttermilk. 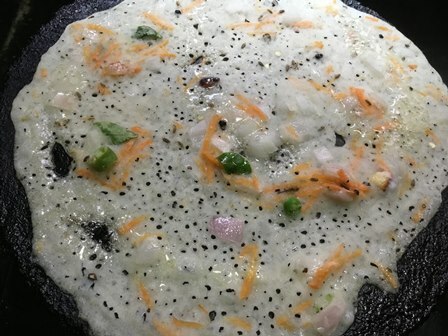 When the batter is mixed with insufficient of water, the batter will be thick, which mean that they cannot be easy to spread the batter easily on the dosa pan and you will get thick rava dosas. If they are mixed with the correct quantity of water the gluten particles in the rava and maida loosen from one another and it will be easy to prepare crispy rava dosa. 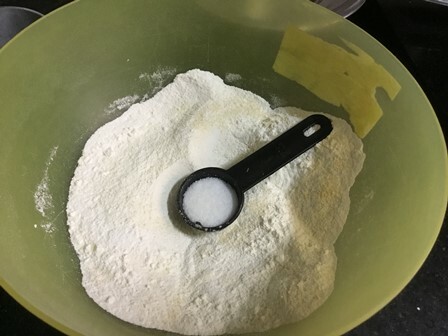 Rice flour is added for the crispness and it helps to stretch the batter easily. 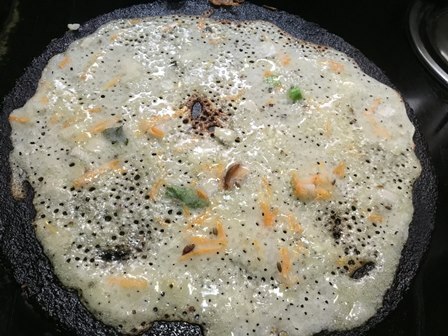 Please do not use idiyappam or puttu flour for this rava dosa because it will entirely change the taste and the texture. Just plain rice flour works good for this rava dosa. If you do not have maida you can replace it with regular wheat flour. For rava dosa, you don’t need to make the batter the night before or an hour before. You can start preparing the dosas after 15 minutes, that means the flours are incorporated with the water without any lumps. This is all based on personal preference, but I usually add chopped onions, grated carrots and cashew nuts. For kids, we can include finely chopped tutti fruti and nuts. For homemade rava dosas its difficult to pour the batter with a small bowl. So you can use a ladle to pour the batter. It’s really easy to pour the batter with a ladle. You can add ghee or oil for cooking dosas. The common mistake that everybody makes is flipping the dosas too early. For rava dosas cook for a second after flipping or no need to cook on the other side. 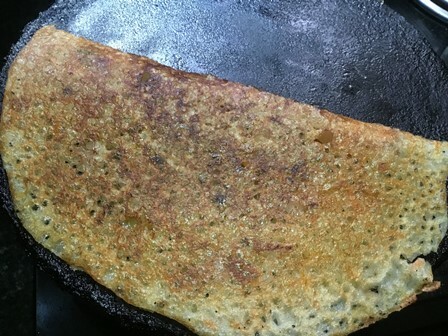 When the dosa turns golden brown on the surface, gently lift the dosa with a thin spatula and then fold it. Try to spread the batter as thin as possible for perfect dosas. Rava dosa is the common tiffin dish seen in most of the South Indian restaurants. The basic ingredients needed for rava dosa are rava, maida or atta flour and rice flour. For flavours crushed or whole black peppercorns, cumins, curry leaves are added. 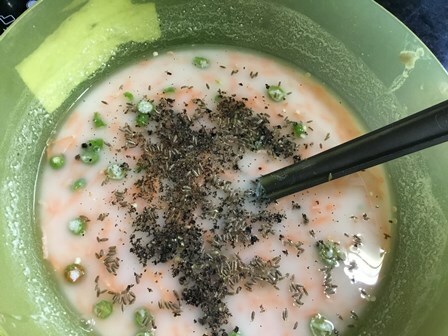 Take a wide mixing bowl and add the rava, maida and rice flour. Mix them well with a dry spoon. Next, add the required salt and mix them well. Now slowly add in the water to mix them well with a ladle or whisk to stir everything together. Next, add the grated carrots and chopped green chillies. Mix them well and add the crushed or whole black pepper and cumins. 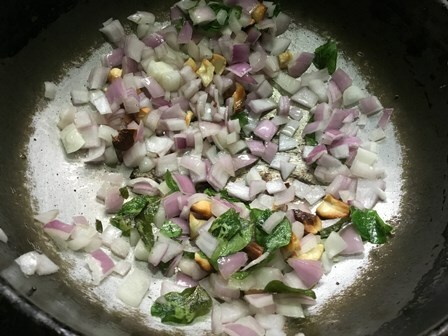 Heat a tbsp of oil in a small pan and fry the curry leaves and cashew nuts. When they turn golden brown, add the onions and saute for a minute and turn off the heat. Allow them to cool down.Add the sauted ingredients to the batter and mix them well. Heat a dosa pan over medium heat. For each rava dosa, take 1 to 1.5 ladle full of batter and pour it in a circular motion starting from the edges to the centre of the dosa pan. Swirl 1 to 2 tbsp oil or ghee around the dosa and cook until browned on the underside, 2 to 3 minutes or more. You can also gently flip the dosa, and cook for a minute on the other side. Transfer the dosa to the plate. 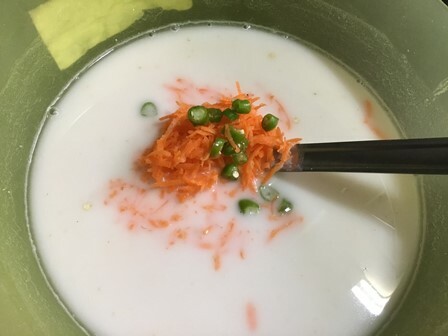 Take a wide mixing bowl and add the rava, maida and rice flour. Mix them well with a dry spoon. Next add the required salt and mix them well. The consistency should be like watery as shown in the picture. Is should be easy to pour from the edges to the centre of the pan. Keep it aside for 10 to 15 minutes. Next, add the grated carrots and chopped green chillies. Mix them well and add the crushed or whole black pepper and cumins. 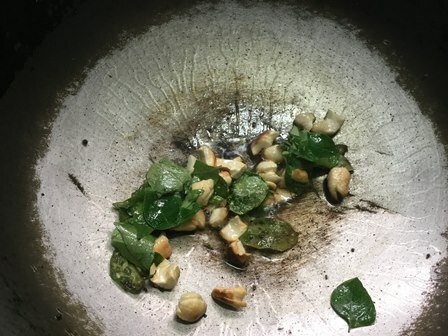 Heat a tbsp of oil in a small pan and fry the curry leaves and cashew nuts. When they turn golden brown, add the onions and saute for a minute and turn off the heat. Allow them to cool down. Add the sauted ingredients to the batter and mix them well. Heat a dosa pan over medium heat. Carefully rub the dosa pan with oiled small piece of white cloth. 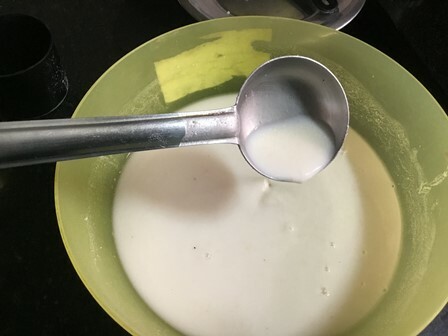 For each rava dosa, take 1 to 1.5 ladle full of batter and pour it in a circular motion starting from the edges to the centre of the dosa pan. Swirl 1 to 2 tbsp oil or ghee around the dosa and cook until browned on the underside, 2 to 3 minutes or more. You can also gently flip the dosa, and cook for a minute on the other side. Transfer the dosa to the plate. 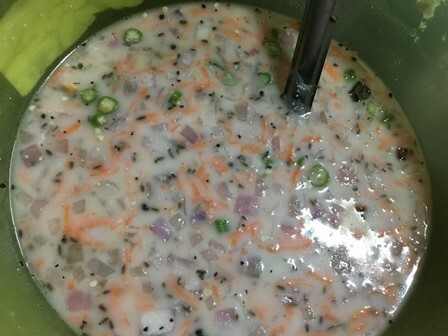 Serve it immediately with sambar and chutney. Enjoy this rava dosas with your family for a weekend breakfast or dinner.